OMG I have a completed top! 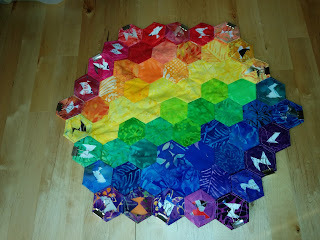 My OMG for this month (goal setter #46) was to finish piecing the top for my niece's I Spy quilt. I asked my brother & sister-in-law over a year ago if I could make a quilt for Verona's big girl bed, whenever it is that she moves into one. 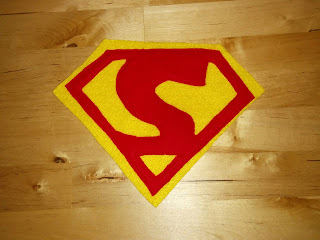 I wanted an I Spy similar to the one I made for the bed in Munchkin's room when I was pregnant (predates blog). 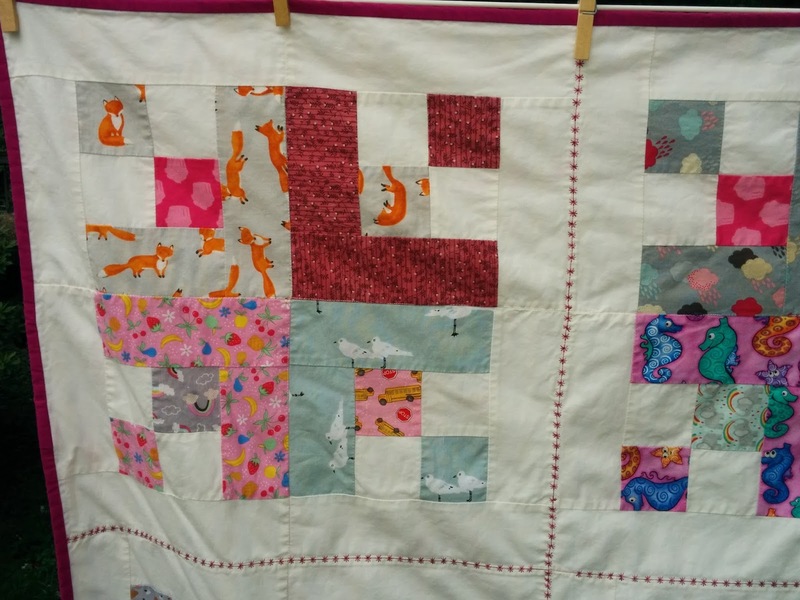 This one is twin-sized and has 192 I Spy squares. My brother and his family will be visiting the day after my niece's 3rd birthday, so I really want to get this completed before that visit. I'm so pleased with it, and can't wait to have it completely finished! 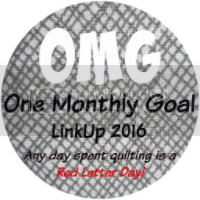 I'm linking up with Heidi at Red Letter Quilts for the October One Monthly Goal completion party. I think it was last summer that I found a really good deal on a mini jelly roll. I had just discovered the Fat Quarter Shop's Shortcut Quilt Series on YouTube, and I looked at both Jelly Roll Jam and Jelly Roll Jam II patterns. I went with Jelly Roll Jam II. This jelly roll didn't have as much variety in prints as most do, but I'm still pleased with how it turned out. At a recent Project Linus meeting, a fellow volunteer (blanketeer!) 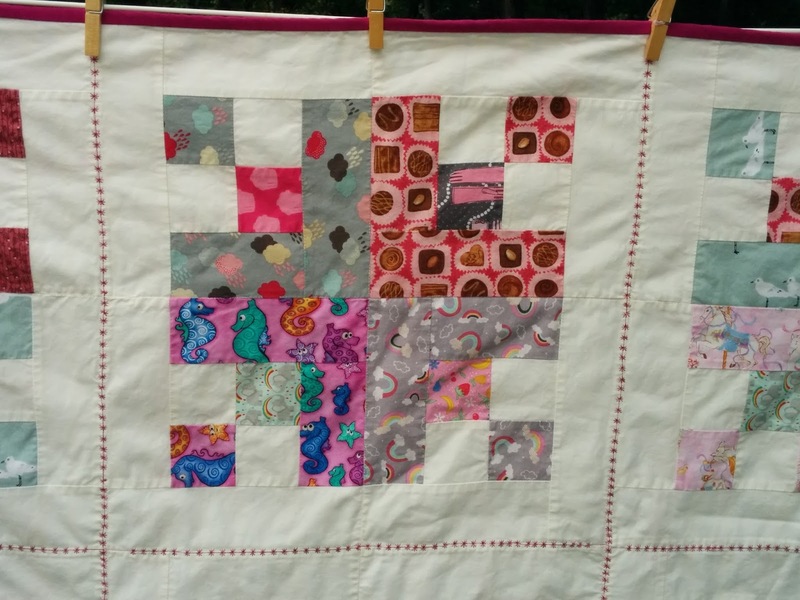 showed me a quilt that she quilted with a continuous circle. I had been wanting to try that and thought this one might be a good one for it. You can kind of see it from this picture. 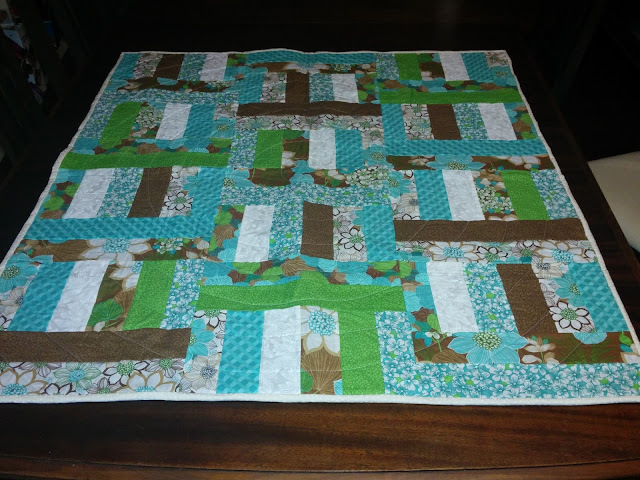 I liked this way of quilting and think it's pretty likely I'll use it again in the future. It went rather quickly, and since the actual quilting is my least favorite step after layering, quick is good! And I'm happy with how it looks. 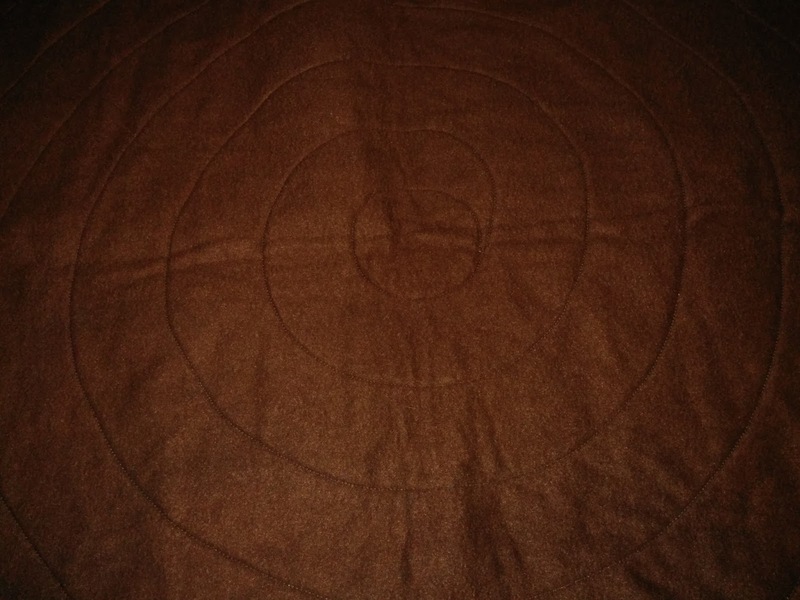 In case you are wondering, that backing is brown fleece. 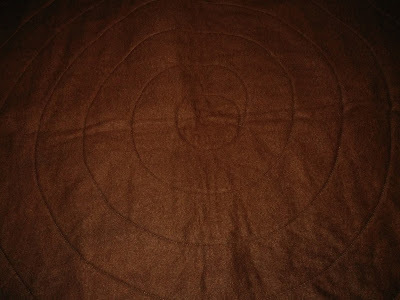 I back almost all my Project Linus quilts with fleece (no batting). I really like the overall weight and it gives it such a snuggly feel. It's also easier to layer and let's face it, it's cheaper. 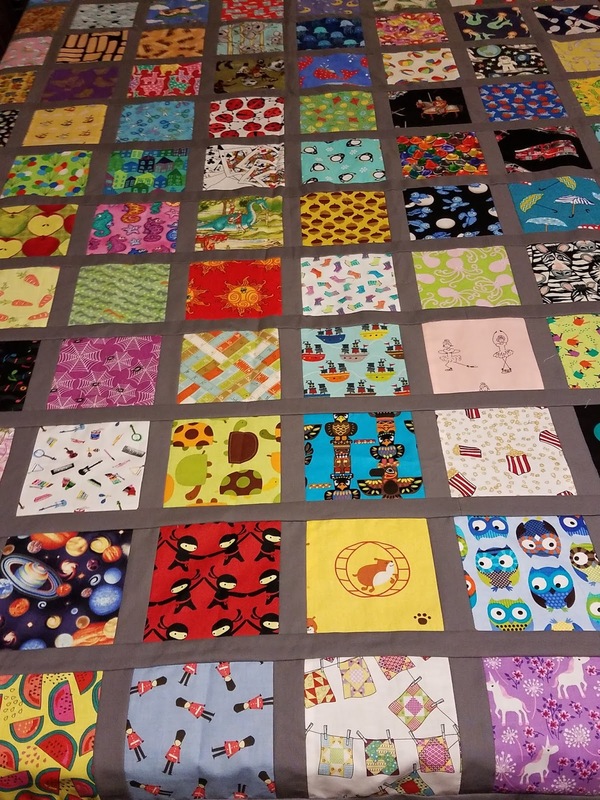 It allows me to do more donation quilts over all. This was on my list of Q4 goals for the globally hosted finish along. (It's goal #15 on my list.) 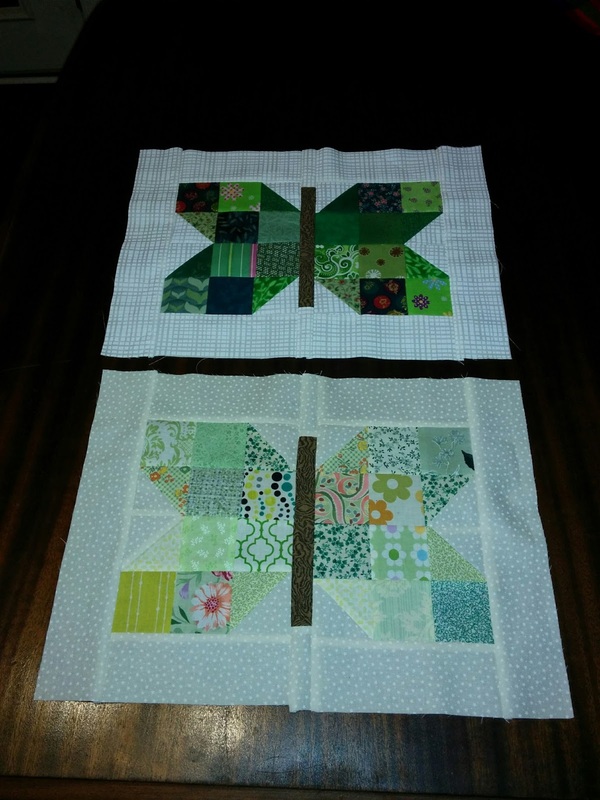 I'll also be linking up with Julie at the The Crafty Quilter for her monthly "Hello 2016, Goodbye UFOs" monthly linkup. 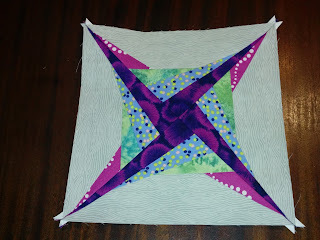 I am slowly catching up on my butterfly blocks for the Rainbow Scrap Challenge. Aqua was June's color. Oh, well. Better late than never, right? I didn't have a ton of aqua so there is more repetition than in some of the others, and some may not truly be aqua. But I love that this is a low rules challenge. 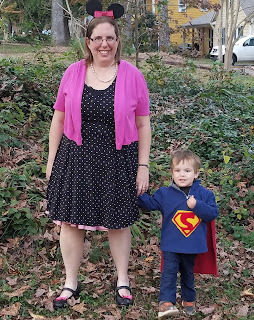 Linking up with So Scrappy, the mastermind and hostess of the Rainbow Scrap Challenge. I like how the block came together, and Lauren mentioned that there were no points to match! My favorite kind of block! I actually really like the block, though I'm not sure I'd want to do enough to make a full sized project out of it. 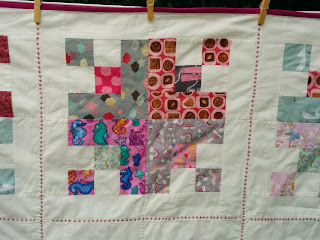 And it was good to brush up on my paper piecing skills; I hadn't done any in a while. The Stash Bee will start taking sign ups on November 1st for 2017. This was my first year and I am absolutely doing it again! It's a fun way to engage with other quilters from around the globe, and it's neat to try lots of different blocks that you wouldn't do otherwise, without the commitment of making a whole lot of them. 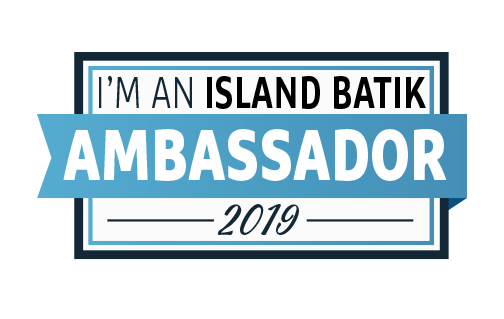 I'll post the link when sign-ups are open, but if anyone is interested and has any questions, let me know. I am a big fan of the Finish Along, this year with multiple hosts from around the globe. I did well in Quarter 3, finishing 5 projects and getting several more closer to completion. And, of course, I came up with even more I want to do! 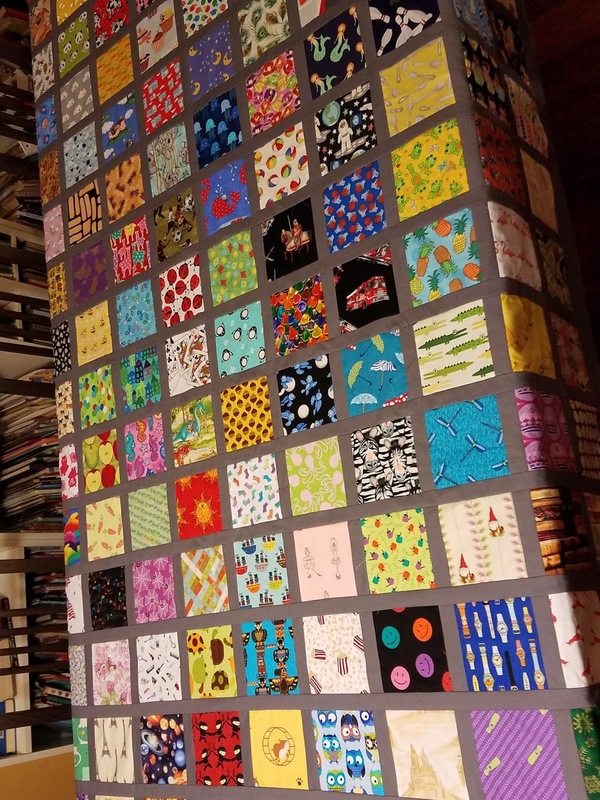 I've been making a twin-sized I Spy quilt for my niece. She's coming to visit in December and will be here the day after her birthday, so this is a must finish. 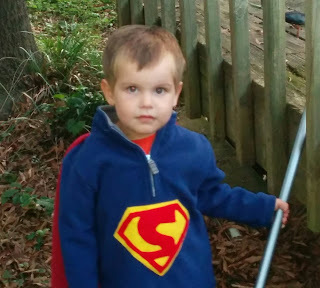 I found a great book on making costumes from hooded sweatshirts. 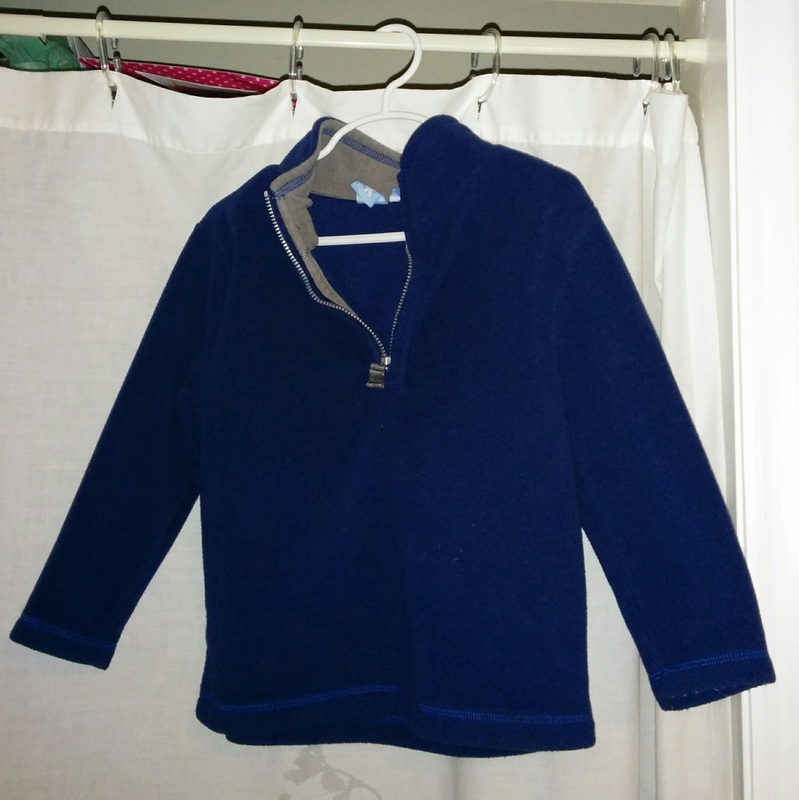 I recently bought a blue fleece pullover at a kids' consignment sale that will become a Superman costume. Here is my very basic Superman symbol made from felt. It should be noted that I am going for recognizable and not necessarily completely authentic. 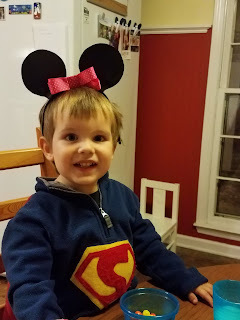 My kid is crazy about trucks, and we can't go anywhere without having a few with us. I'm planning on making him some sort of carrier and/or play mat for Christmas. I've seen a variety of patterns, included those recapped here. I'm planning to combine 2 patterns that I like. My hand sewing batik hexie project is progressing slowly. I have the top all together, all the extras hexies for the back are completed and sewn together, now I am sewing the back to the front. I'm sort of making up the finishing process as I go along, as I haven't found a tutorial that completely works for me. I've been into strips lately. 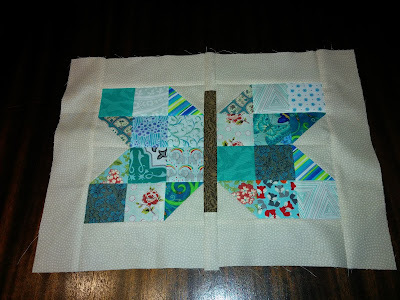 I found a great deal on a mini jelly roll, and I'm using the Fat Quarter Shop's Jelly Roll Jam II tutorial. Top is now complete, but I don't have a progress picture. I've been doing a scrap quilt as my leader and ender project and it is now ready to be joined into the bigger blocks that will make up the completed quilt. 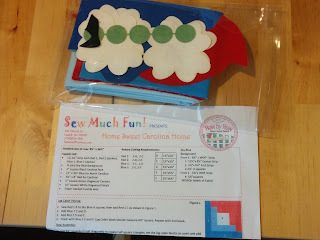 I'm linking up with She Can Quilt and the global FAL hosts. 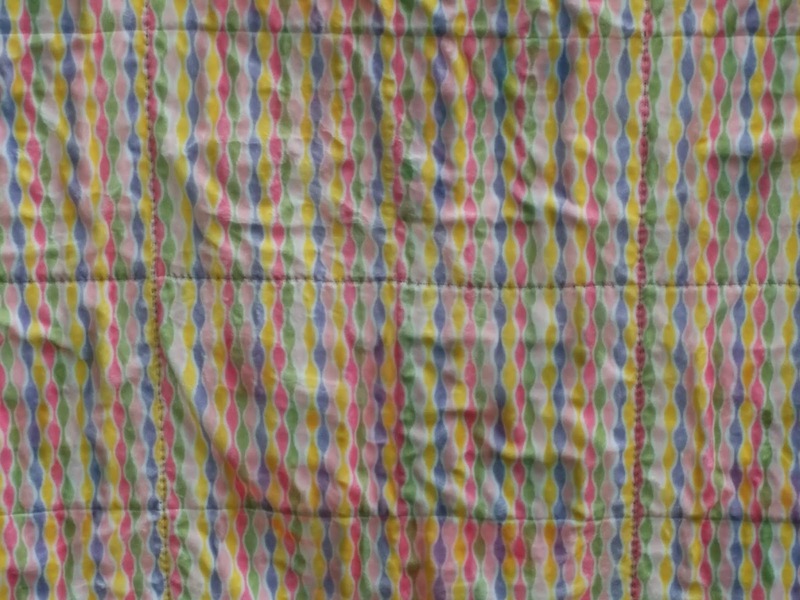 It's no secret that I love I Spy quilts. I am making a twin-bed sized I Spy for my niece. She will be visiting in early December and I want to have it ready for her then. 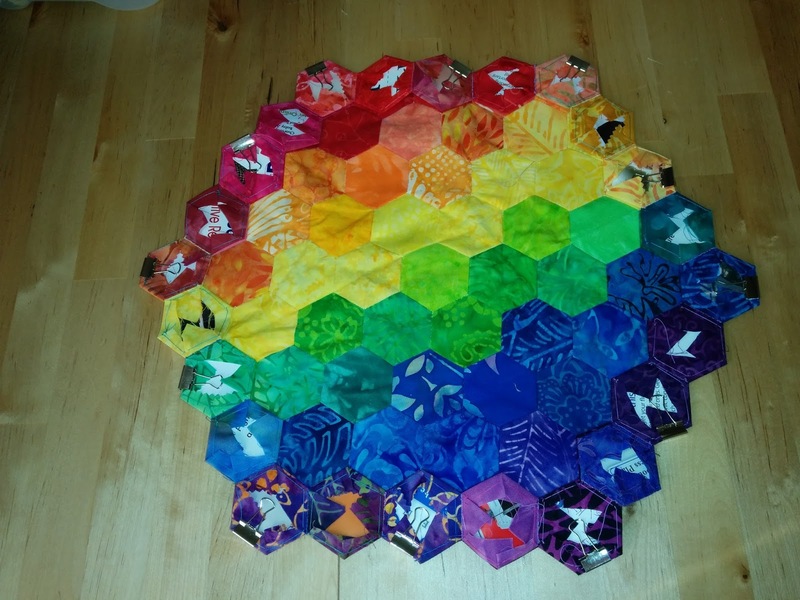 So my October One Monthly Goal is to finish piecing the top. I've been constructing it in double rows. I need 8 double rows and I have 6 completed right now. 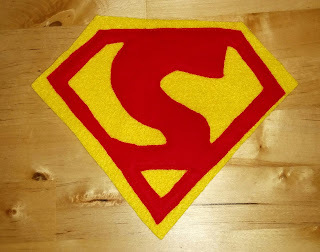 SO I need to finish the last 2, sew the rows together, and add sashing to the outside. Linking up with Heidi at Red Letter Quilts for her OMG challenge. I had just hosed a swap of 2 1/2" strips of I Spy fabrics. 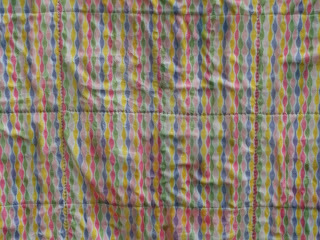 I knew I wanted to make a pink & gray quilt, and this pattern was 2 1/2" strip friendly, though it wasn't advertised that way. So I cut up my pieces and set it out as a leader & ender project. The background is Kona Snow. 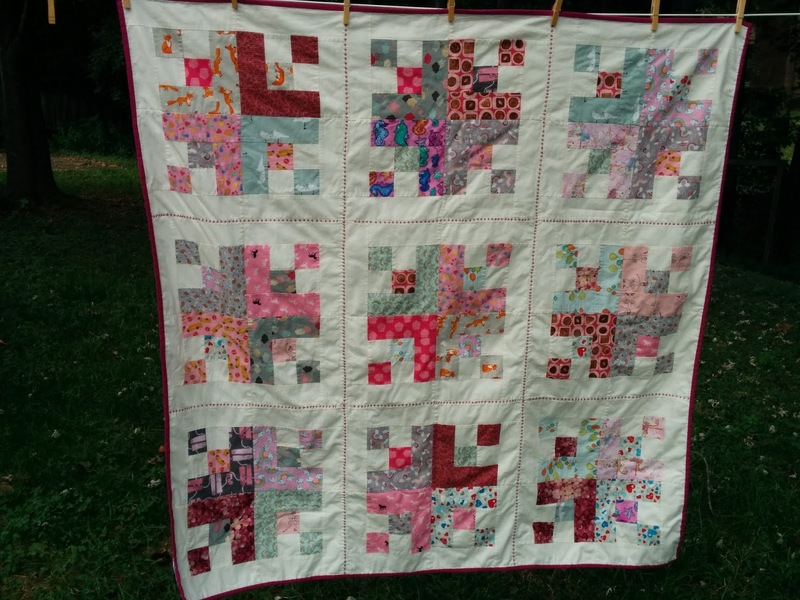 Appropriate for a quilt of snowflakes! Once I had all the blocks made, I decided I wasn't crazy about the original layout, so I played around and ended up with this instead. 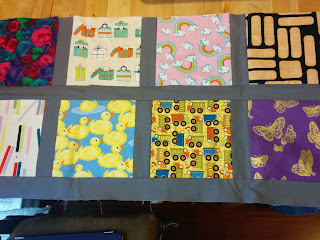 My layout meant I needed an equal number of pink and gray blocks, so I had to make a few extra gray blocks. 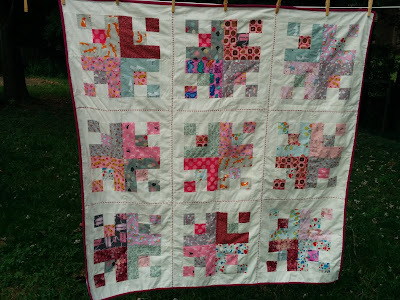 In addition to some straight line quilting, I decided to use a decorative stitch in bright pink to frame each of the big blocks. I'm happy with how this looks. Usually I care that the orientation of my I Spy fabrics are as "correct" as possible. This block got me over that! There was no way to get everything to face the same way, so I didn't even try. 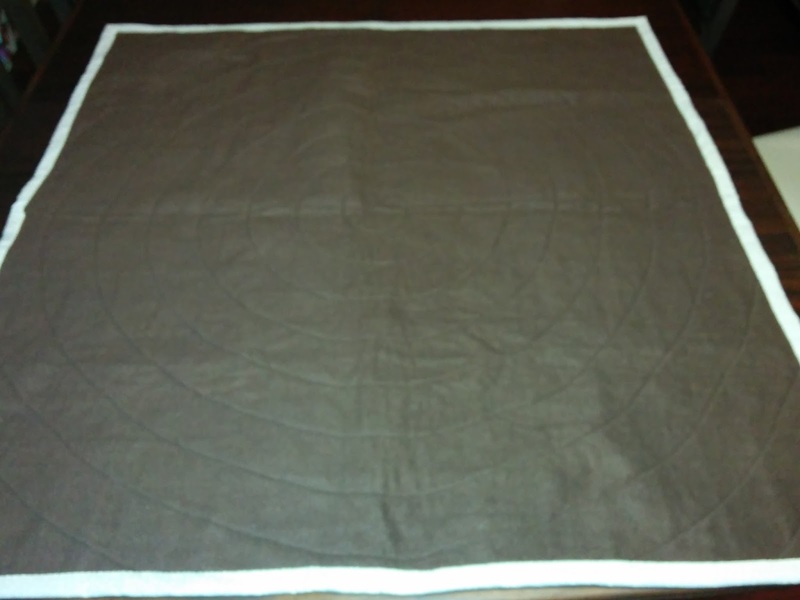 I generally back my Project Linus quilts with fleece, but someone had donated a large piece of minky and it fit the size of this quilt nicely. 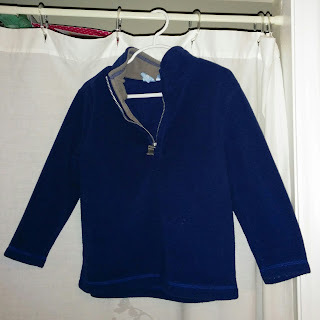 I love the feel of the minky, but working with it was more challenging than my normal fleece. First of all, it sheds when cut. And when hand-sewing the binding, I had a hard time catching the binding and the minky but not the front of the quilt. So if I use any again, I will machine sew the binding. This was on my list of Q3 goals for the globally hosted finish along (goal #13). I am seriously behind on my butterfly blocks for the Rainbow Scrap Challenge hosted by So Scrappy. 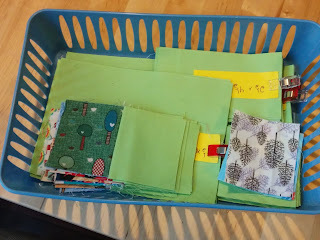 I've been motivated lately to catch up because I have decided what to do with my butterflies-I have a friend who is pregnant and she loves scrappy quilts. So these butterflies will be a baby present for a little lady expected in December. Green was the color for May. But late is better than never, and so I give you green butterflies! When I have enough of a color for multiple butterflies, I sort by light/dark. In this case, I used light for one and dark & bright for the other. Now on to Aqua!